N49732/HELITAC 672 Bell 214B-1 BigLifter (MSN 28005) of McDermott Aviation, leased by Department of Fire and Emergency Services, at Jandakot Airport – Thu 17 October 2013. Queensland-based McDermott Aviation won the tender to provide fire fighting helicopters for the 2013/14 bush fire season (October – April). 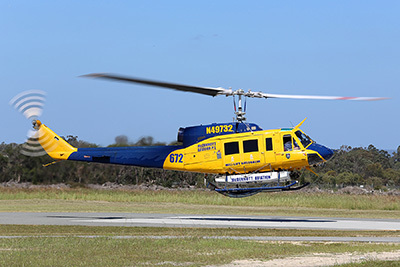 The Bell 214B is the most powerful (2950 SHP) single engine helicopter in the world, fitted with the Isolair ‘Tsunami” Belly Tank, with 2,700 Litres capacity. Built in 1976. Ex N49732, 101 (Royal Air Force of Oman), 751(Royal Air Force of Oman).